Clara relates that her father was above all a merciful man. Lejeune’s devotion to his family brought him home for three meals a day and evening prayer throughout his entire career. 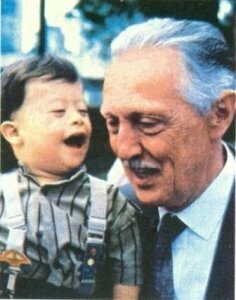 His love for his mentally and physically disabled patients inspired brilliant scientific research, but more importantly, it engendered an unwavering commitment to these “disinherited,” as he called them, “Disinherited because their genetic heritage was not perfect. Disinherited because they were the unloved members of this competitive, glamorous society.” When Lejeune became united with the disinherited, he found himself opposed to a society that valued perfection and convenience over the right of a person to live. This article first appeared in the Spring 2009 edition of The Sign of Peace.